I graduated from Hanoi University of Science and Technology in 2007, and my major is biotechnology. Before came to Japan, I worked at Molecular Biology Division, Agricultural Genetics Institute. I have joined some national and international projects and worked as a key researcher. My research was to concentrate on co-operation Research and Development of Native Rice in Lao PDR and Vietnam. Of which, it was successful to collect the native rice germplasm of Vietnam and Laos and evaluate their yield potential and tolerance with abiotic and biotic stresses (included pests, diseases infestation, drought) in the controlled condition, greenhouse and field condition. I also researched and applied the molecular markers linkage with QTLs/genes of high yield potential to create super yield of conventional rice. The main goal of this research is to apply molecular assisted backcrossing (MABC) breeding strategy and use molecular markers techniques as valuable tools to enhance yield potential for some popular Vietnamese rice varieties. From 2013, I was a student of Global Environmental Leaders Education Program and I completed my Master course at Graduate School for International Development and Cooperation in Hiroshima University in 2015. Through Global Environmental Leaders Education Program, I acquired practical knowledge and skills useful for practicing environmental management. Rice is a staple crop of many countries in the world and Asians. One of the most serious and widespread diseases of rice is blast caused by fungus Pyricularia grisea. To understand more clearly and prevent blast disease are major missions of rice researches. Secondary metabolites are organic compounds that are not directly involved in the normal growth, development, or reproduction of an organism. Secondary metabolites often play an important role in plant defense against pathogen. Phenolic is a group of secondary metabolites that were demonstrated to have antifungal activity. My research is to determine and quantify phenolic compounds on rice leaves relate to resistant capacity. 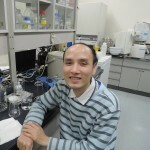 My research is looking for organic compounds to protect rice against blast disease. I also recognized some problem impact to rice production of Japan. I am planning to create a sustainable development of rice production in Japan. Through the help of TAOYAKA program, I do hope to learn the great experience of Japan and other countries to build and manage flexible and peaceful regional societies. I also would like to find out about diverse regional societies and cultures as far as possible. And through discussion with students from different fields, I could understand deeply and have wide vision in multicultural existence as well as acquire self-reliance, the drive to take action, multifaceted approach in thinking and creativity in order to identify and develop advanced scientific knowledge and technologies in my specialty that are necessary in resolving regional issues. I do hope that I will become a biological scientist with deep professional knowledge and extensive vision in both cultural and social field. If I have chance I would like to contribute my understanding to improving regions in my country in particular and all over the world in general. I also will try to popularize the knowledge that I learnt from this program to people in my country and international friends.